Blazing light surroundsspace shuttle Endeavour, eclipsing the light from the nearby full moon, as it roars into space from Launch Pad 39A at NASA's Kennedy Space Center during the launch of the STS-126 mission. Liftoff was on time at 7:55 p.m. EST. This was amomentous year for spaceflight. It saw the launch of the world's most powerfulgamma-ray telescope, the space station's largest room, India's first moonprobe, and even a space tourist who happens to be America's firstsecond-generation space traveler. 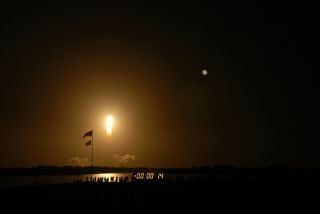 RichardGarriott, the son of former NASA astronaut Owen Garriott, became the firstAmerican second-generationspaceflyer to reach orbit when he launched aboard a Soyuz rocket inOctober. For a hefty $30 million, paid to the Russian Federal Space Agencythrough the private U.S. firm Space Adventures, Garriott booked himself a10-day vacation on the International Space Station (ISS). During his stayGarriott conducted science experiments, educational outreach activities, andeven brought aboard a flash drive loaded with records of humanity's greatestachievements, copies of the avatars in one of his games and digital versions ofselected humans' DNA, including that of comedian Stephen Colbert, host of"The Colbert Report." By coincidence, Garriott flew to the spacestation while it was under the command of Russian cosmonaut Sergei Volkov,himself a second-generation spaceflyer and the son of famed cosmonaut AlexanderVolkov. The two spaceflyers met in orbit and returned to Earth together inlater October. NASAlaunched four spaceshuttle missions in 2008 ? and returned each of them safely back home.That's the most shuttle liftoffs since 2002, and especially noteworthy in thewake of the Columbia tragedy of 2003. This year's flights each delivered vitalcomponents to the ISS, including major contributions from Japan, Europe andCanada. And the year almost saw one more shuttle flight ? the final servicingmission to Hubble ? but that launch was delayed until 2009 because of glitcheson the orbiting telescope. NASA currently plans to launch nine more shuttlemissions before retiring the fleet in 2010. Six of those flights are scheduledfor 2009. Some of thecosmos' most puzzling phenomena ? supermassive black holes, dark matter andmysterious explosions called gamma-ray bursts ? may soon be more understandablethanks to NASA's Fermi Gamma-ray Space Telescope, which launchedin June. The world's most powerful telescope for observing the universe inhigh-energy gamma-ray light, the observatory was originally called theGamma-ray Large Area Telescope (GLAST), but was rechristened after Italianscientist Enrico Fermi once the telescope was up and running in space. Theflotilla of space station-bound spacecraft had been static for the last nineyears until a new ship was added to the ranks in March. Europe's JulesVerne Automated Transfer Vehicle was the first of a new fleet of unmannedcargo ships designed to ferry food and supplies to astronauts on the orbitinglaboratory. After launching and docking at the station successfully, thevehicle perished as designed in a fiery plunge through the atmosphere back toEarth. The double-decker bus-sized spacecraft is due to be succeeded by atleast four sister freighter ships. For thepast 10 years the ISS has been serenely floating above us, steadily growing insize and hosting more and more scientific cooperation between nations. The $100billion space station marked its 10thanniversary Nov. 20, a decade after its first room, the Russian-built Zaryamodule, was launched into space. Over the years the lab has grown from theequivalent of a studio apartment into a three-bedroom house, hosted about 165visitors from 15 countries, and circled the Earth more than 57,309 times. InJune the laboratory got its biggest addition yet, the tour bus-sized JapaneseKibo module. The stately space station is not yet complete, though ? eight ofNASA?s remaining shuttle missions will deliver its remaining components by2010. In a majormilestone, the Space Exploration Technologies (SpaceX) firm successfullylaunched its Falcon 1 rocket in September, capping off the company'ssix-year effort to lift the first non-governmental rocket into space. Arrivingon the heels of three consecutive failed launch attempts, the Falcon 1'ssuccess was no foregone conclusion. The liquid-fueled booster's liftoff fromthe Kwajalein Atoll in the Pacific Ocean proved that SpaceX's engineering issound, and the company is on its way toward fulfilling its goal of offeringlow-cost commercial rocket launches. It took about $100 million to develop andtest the booster, but future flights should carry an $8 million price tag orless, the company said. SpaceX is now preparing to launch its larger Falcon 9rocket from Cape Canaveral, Fla., and is one of two firms to win a NASA space stationcargo contract on Tuesday. India's Chandrayaan1 probe became the nation's first spacecraft to travel beyond Earth orbitwhen it arrived at the moon in November to begin a planned two-year mission.The vehicle carried a mini craft painted in the red, white and green pattern ofIndia's flag that crash-landed at the moon's south pole, taking pictures on itsway down. The achievement establishes India's growing space prowess and setsthe stage for the country's planned future goals of starting a manned spaceprogram and landing a rover on the moon. In anotherfirst for a nation building up its space program, Chinese astronauts carriedout theircountry's first spacewalk in September. China launched three astronauts onthe Shenzhou 7 mission, the nation's third manned spaceflight. Zhai Zhigangbecame the first Chinese spacewalker when he stepped out of his space shipwearing a new Chinese-made spacesuit. During his 20-miute foray into space,Zhigang retrieved a test sample of lubricant from outside the vehicle, andwaived a Chinese flag at the camera that was broadcasting his feat live. Theevent marked an impressive technological achievement for China, only the thirdcountry after Russia and the United States to independently launch a personinto space. NASA's PhoenixMars Lander touched down on the red planet in May in the first successfulMars landing since 2004. The stationary spacecraft spent more than five monthstesting the arctic plains environment for signs of habitability by potentialMartian life, and confirmed the presence of water ice below the ground. Phoenixtouched down farther north on Mars than any lander before it, and delivered atreasure trove of images and experimental results from our neighboring planet.After its prolific research stint, the lander finally ran out of power on Nov.2 due to decreasing sunlight caused by the arctic transition from summer tofall and light-obscuring atmospheric dust. On Oct. 1the National Aeronautics and Space Administration turned 50 years old, markinga half century of achievements in space exploration that many would havedoubted were possible before its founding in 1958. While some people are stillsmarting over the continued absence of flying cars, most can recognize thatNASA has come a long way since the days when Americans watched with envy asSputnik flew overhead. We won the moon (and may be racing back to it all overagain), built a fleet of reusable space shuttles, and worked with other nationsto construct a continuously-occupied floating space station for scientificresearch. There have also been horrific tragedies along the way: the lives ofthe Apollo 1, Challenger and Columbia astronauts attest to the fact that thosegreat achievements weren't attained without a price. But for all theheartbreaks, setbacks and even public boredom with NASA, Americans can't seemto give up the dream of space. Who knows what the next 50years will bring?